Oocytes are checked for fertilisation between 16-20 hours post-insemination. This means that it can be a fine balancing act between when to attempt to fertilise your eggs (via IVF or ICSI) and the time at which we will need to be checking for fertilisation the following day. At this stage we are looking for two pronuclei (PN) (one each from the female and from the male), two polar bodies (PB) (the egg’s way of getting rid of the extra sets of chromosomes) as well as any abnormal features. Not all eggs will fertilise, this may be because the egg is either immature or post-mature, and as a result, will have a decreased ability to fertilise. Sometimes when there are many eggs which do no fertilise, it can indicate some kind of problem with the egg quality. The scientific name for an embryo at this stage is a zygote. Below are some images to depict what fertilisation looks like and what we look for in the laboratory during your treatment. 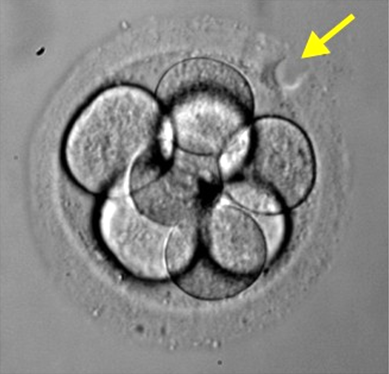 The zygote has 2PN (yellow arrows) and 2PB with no abnormal features. The images below show an oocyte with 0PN, a zygote with 1PN (with an abnormal feature of a vacuole) and a zygote with 3PN. These embryos would be discarded, as they will not form a viable pregnancy. Yellow arrows show PN location. Cell Number, Size/Shape: On day 2, we expect embryos to have between 2-4 cells (also known as blastomeres). 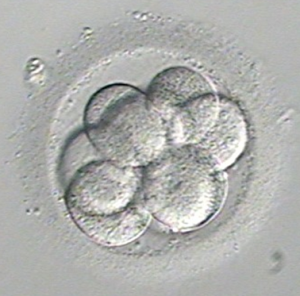 By day 3, we would like the embryos to be between 6-8 cells, with lower quality embryos having fewer cells. Also, better quality embryos have round, evenly sized cells/blastomeres. The picture above shows a day 3 embryo that has the correct cell number, as well as normal cell size and shape. Fragmentation: Embryo fragmentation is an uneven/unclean division of the cells in the embryo. The picture below shows varying degrees of fragmentation. We like to think about it in terms of breaking a biscuit. When the cells in an embryo divide, it should be clean and even. However sometimes, like when you try to break a biscuit, crumbs or fragments are formed. In the embryo, these fragments are usually excluded, as they are of no use to the embryo and we consider them “junk” pieces. The higher the degree of fragmentation, the lower the likelihood of pregnancy as these excluded pieces could contain vital genetic material needed for normal embryonic development. Multi-Nucleation: Each cell within the embryo should contain one nucleus only, any more or less mean that the cell is considered abnormal. Embryos which contain multi-nucleation have been shown to have a reduced chance of forming a viable pregnancy and as such, generally would not be considered suitable for transfer or freezing. It is more likely to see this on day 2 as opposed to day 3, since the cells inside the embryo are fewer and larger. 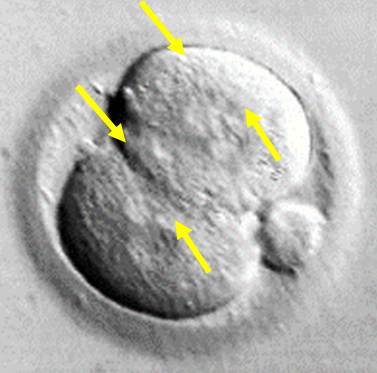 The picture shows an abnormal embryo with multiple nuclei clearly seen in each cell (yellow arrows). Thickness of the egg shell (or zona pellucida): In some patients, the egg shell is thickened and will ultimately make it difficult for the embryo to ‘hatch out’ by day 5/6. In this instance, we can utilise a technique called Assisted Hatching, to allow us to make a small incision in the shell to assist these embryos. 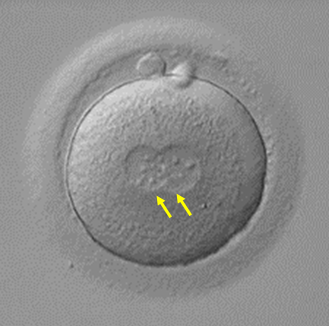 The picture beside shows an embryo that has undergone Assisted Hatching, the yellow arrow indicates where the incision has been made. Day 4 checks are not routine practice for Fertility Solutions. This is because observing embryos on this day does not usually give us much additional information about quality and once again exposes embryos to unnecessary external environmental factors. 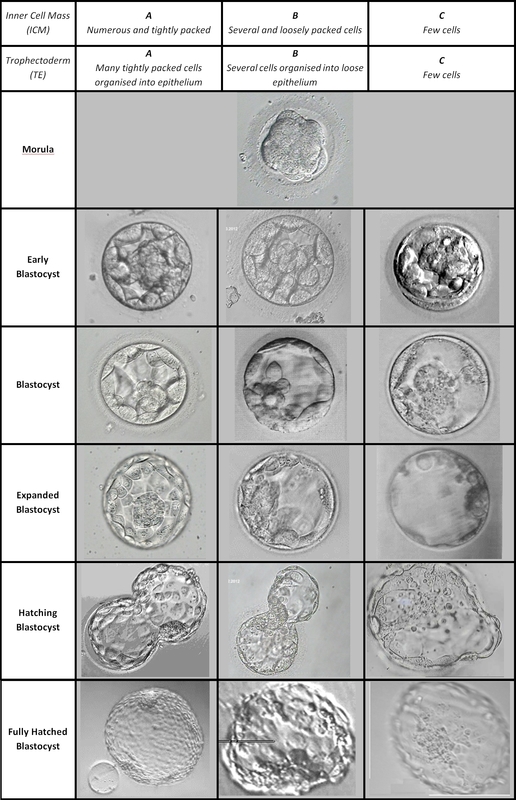 As development of the blastocyst progresses, the two cell types divide and the fluid cavity enlarges. 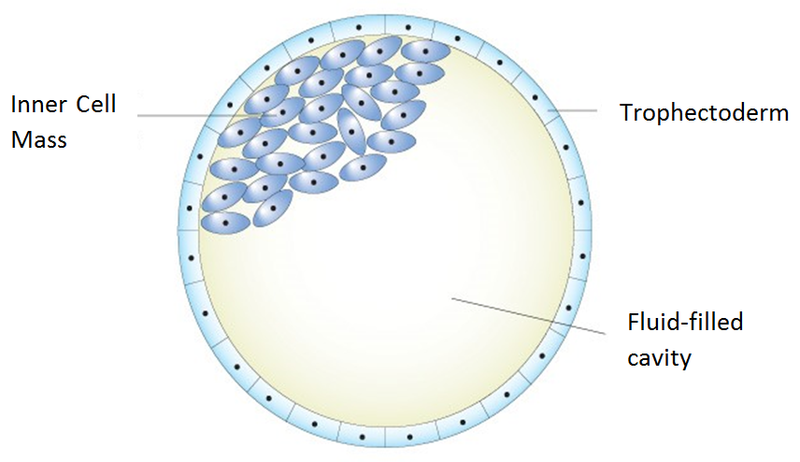 With continued blastocyst development the embryo expands, the shell thins, and it hatches from its shell. Blastocyst implantation into the lining of the uterus can then begin. Fertility Solutions, and many other IVF clinics worldwide use a blastocyst scoring system originally developed and published by Dr. David Gardner in the late 1990’s. Dr. Gardner is well known for being the first to develop a commercially available embryo culture media system which supported high rates of viable blastocyst development. There are other grading systems for blastocysts, but this one is the most widely used. If embryos are able to be cultured until day 5/6, we are able to utilise all the observations from the previous day’s checks. This gives us a lot of valuable information in order to select those embryos with the greatest implantation potential. The ability to identify those embryos has given us the opportunity to transfer fewer embryos and at the same time maintaining high pregnancy rates while reducing the incidence of multiple births. It should be noted that we try to take into consideration all of the historical benchmarks of the embryo when selecting an embryo at the time of transfer. In a perfect world all the benchmarks will have been met, however in IVF there are numerous pregnancies resulting from embryos that did not meet all of the criteria. It should also be remembered that although grading is used by staff to assess an embryos suitability for transfer or freezing that it is not the be-all and end-all. This is simply a morphological grade to assist with assessing an embryos viability, but there is a lot more to a pregnancy than just morphology. Many beautiful babies have been born from not so beautiful embryos. Understanding embryology can be overwhelming, therefore we encourage our patients to contact our scientific team directly or via enquiries@fssc.com.au, if you have any further questions.